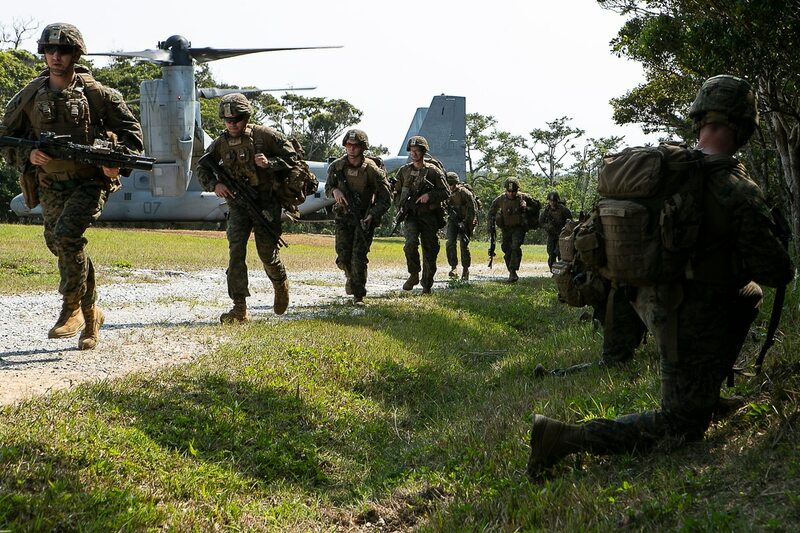 Marines with the 31st Marine Expeditionary Unit, or MEU, seized a small island and airfield with elite special operations airmen and soldiers as part of a test of its future fighting concept. That fighting concept, known as expeditionary advanced base operations, or EABO, will see Marines spread thinly across the vastness of the Pacific Ocean, operating from small bases — a tactic that will help Marines stay alive in a high-end fight with China. EABO is still in the early stages of experimentation. The concept recently was signed off by Commandant of the Marine Corps Gen. Robert B. Neller, but still awaits the signature of Chief of Naval Operations Adm. John Richardson. It’s a fight that will require assistance from the other services and the recent exercise that spanned March 11–14 included participation by U.S. Air Force 353rd Special Operations Group and soldiers with 1st Battalion, 1st Special Forces Group, according to details in a command release. The exercise kicked off with the insertion of Marine reconnaissance via a military free-fall jump over Ie Shima Training Facility on Ie Jima Island, which is located off the coast of Okinawa, Japan, according to details in a command release. Grunts with 1st Battalion, 4th Marines then carried out a long-range raid to seize the island’s airfield, moving nearly 600 miles by MV-22 Ospreys supported by KC-130 air refuelers, the command release detailed. How new capabilities are spreading the MEU thin and far across the globe. After the airfield was captured, Marines and members of the 353rd Special Operations Group air dropped supplies necessary to establish a refueling and arming point, according to the command release. The refueling point further enabled F-35B stealth-aircraft, the command release said. The Marines also inserted a rocket artillery system known as HIMARS via C-130J to bolster the island with long-range precision fires. The tactic is known as HI-RAIN, a form of airborne artillery raid where HIMARS systems are transported by C-130 and rapidly unloaded to destroy targets, it’s a skill-set the Corps has been trying to hone for several years. HIMARS systems will prove crucial to the Corps’ fight by extending range and helping sink enemy ships and destroying land-based targets. The exercise culminated with another long-range aerial raid where grunts moved more than 900 miles supported by air refuelers. "The 31st MEU's great relationships with Wing, Division and Special Operations Units ensures we are prepared for any crisis,” Col. Robert Brodie, 31st MEU commanding officer, said in a command release. “Over the course of two weeks, the MEU aligned capabilities with these forces and led a small island seizure. We are ready to rapidly seize ground and project lethal combat power," Brodie added. The exercise included many elements of the Corps’ future vision of a fight with a near-peer rival such as long-range fires, distributed operations over vast distances, and use of high-tech F-35 aircraft. "The Indo-Pacific region is incredibly dynamic, so we prepare and train daily for real world crises,” Brodie said in a command release.